On that day, as evening drew on, he said to his disciples, "Let us cross to the other side." Leaving the crowd, they took him with them in the boat just as he was. And other boats were with him. A violent squall came up and waves were breaking over the boat, so that it was already filling up. 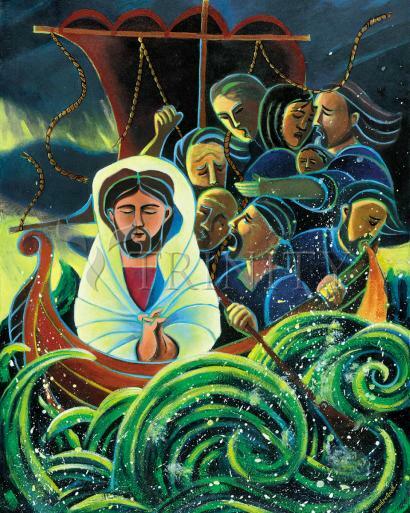 Jesus was in the stern, asleep on a cushion. They woke him and said to him, "Teacher, do you not care that we are perishing?" He woke up, rebuked the wind, and said to the sea, "Quiet! Be still!" The wind ceased and there was great calm. Then he asked them, "Why are you terrified? Do you not yet have faith?" They were filled with great awe and said to one another, "Who then is this whom even wind and sea obey?"